If you always drive with your kids sitting in the back seat, then you understand how difficult it is to keep your vehicle seats clean and organized. Most parents with children find it challenging to keep their cars clean. Having the best vehicle seat organizers will ensure that your car is safe and organized. Nobody wants to have a messy vehicle whenever they are out for a drive with the kids. Here are 5 factors to consider when choosing your vehicle seat organizers. The size of your vehicle is an important consideration when picking an organizer. This is because it will determine the size of organizer that you choose. Buyers that have SUVs or minivans should opt for large organizers as they increase storage space and your van has adequate space. Medium size organizers are ideal for smaller vehicles because they will not take much space. You will find organizers in the market that have specifications for the vehicle types that they are ideal for. The number of pockets that the organizer has is another important consideration. Organizers that have many pockets tend to be more functional and versatile. This is because they have additional storage areas which come in handy when you have lots of items to store. Having lots of storage areas can also be beneficial when you have children because you will have a lot to keep in your car. When buying your seat organizers, you should consider the type of pockets that they have. This is crucial because you want pockets that can hold a wide variety of items. Some storage items will have pockets that are big enough to hold books or magazines. A good car back seat organizer will also have side pockets that are ideal for holding bottled water and other beverages. You should purchase carriers that can be used in different ways. Some vehicle seat organizers will have straps that allow them to be tied onto the seat headrest of your vehicle. Ensure that the straps are adjustable so that they can perfectly fit the size of your car seat. 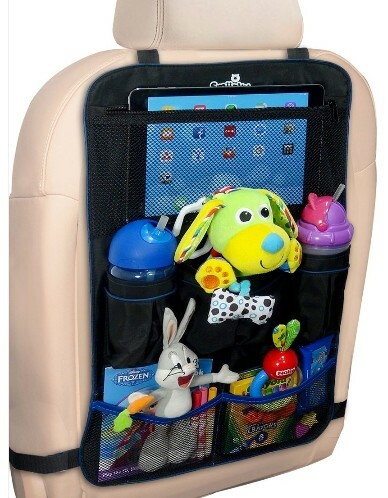 There are some organizers that can also be used as back-pack carriers and these are ideal for picnics or outdoor adventures. When buying your automobile seat organizer, you should consider the color. This is crucial because these items come in a wide variety of colors and patterns. Go for colors that perfectly blend with the existing interior décor of your vehicle. You do not want to have an organizer that contrasts with your vehicle colors and looks out of place. Vehicle owners should consider the material that was used to manufacture the organizer. Make sure that you choose materials that are easy to wash because it will make it easy to clean your organizer. This can come in handy, especially when you have children because you will not have to worry about spills or dirt. The material should also be durable so that you do not have to purchase organizers every time. A good seat organizer will help you keep your vehicle clean and organized at all times.